From left: The Ambassadors of Indonesia, Thailand, Cambodia, the Philippines, Lao PDR, Singapore, Malaysia, Myanmar, and Vietnam, and the Deputy Chief of Mission of Brunei Darussalam. 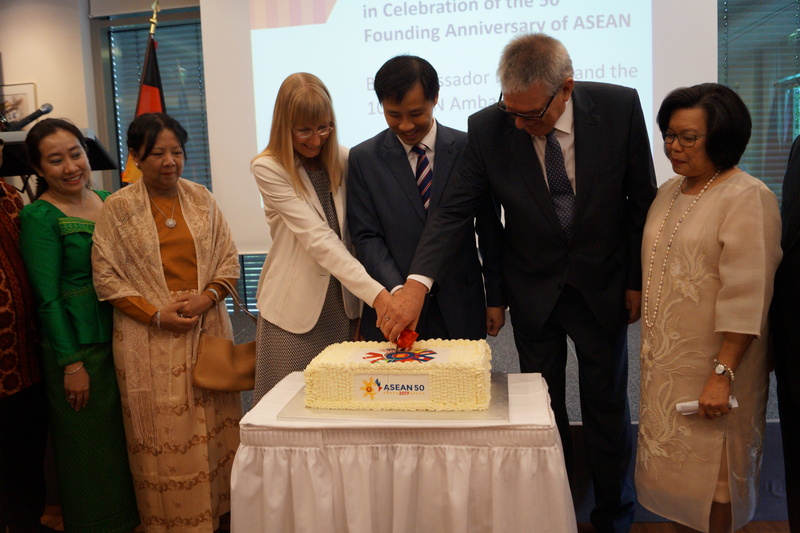 Federal Foreign Office Director General Ina Lepel conveyed the German Government’s congratulations as the Berlin ASEAN Committee (BAC) celebrates the 50th Founding Anniversary of ASEAN. Ambassador Thomeczek welcomes Director General Lepel. 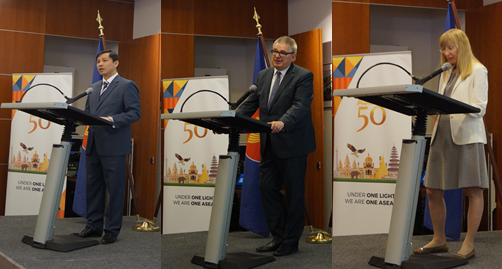 In her speech during the ASEAN Day reception at the Singaporean Embassy last August 8, Director General Lepel underscored the close cooperation, not only between Southeast Asian countries and Germany, but also between ASEAN and the European Union. She added that the EU is increasingly looking at ASEAN and she emphasized the need for close cooperation, especially on non-traditional security challenges such as maritime security, anti-terrorism, cybersecurity, and disaster management. 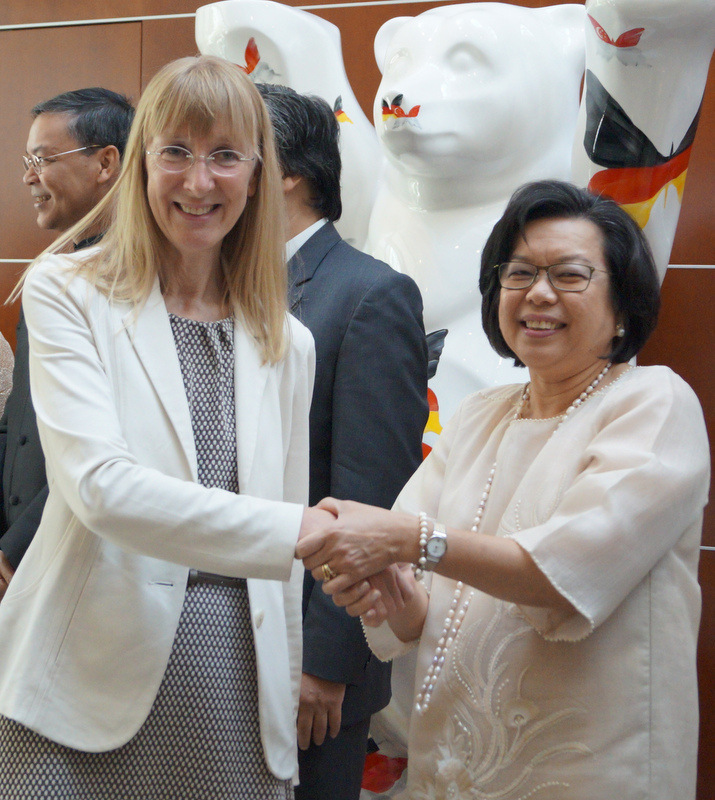 She also thanked the Philippines, the current Chair of ASEAN, for inviting the EU to the East Asia Summit in Manila in November, which Germany considers as an important step in deepening cooperation between the two regional organizations. Dr. Thomas Gambke, Chair of the ASEAN Friendship Group in the German Bundestag (lower house of parliament), meanwhile assured the BAC of his continued support for efforts to promote further cooperation. BAC Chair and Singaporean Ambassador Laurence Bay recalled the establishment of ASEAN in 1967 as a five-member organization. He highlighted the impressive development that the current 10 ASEAN Members States have achieved so far, with their combined GDP of approximately 2.6 trillion US dollars, and the region’s strong economic fundamentals. Ambassador Bay also noted that the EU is ASEAN’s second largest trading partner, with more than 246 billion euros-worth of trade in goods and services. 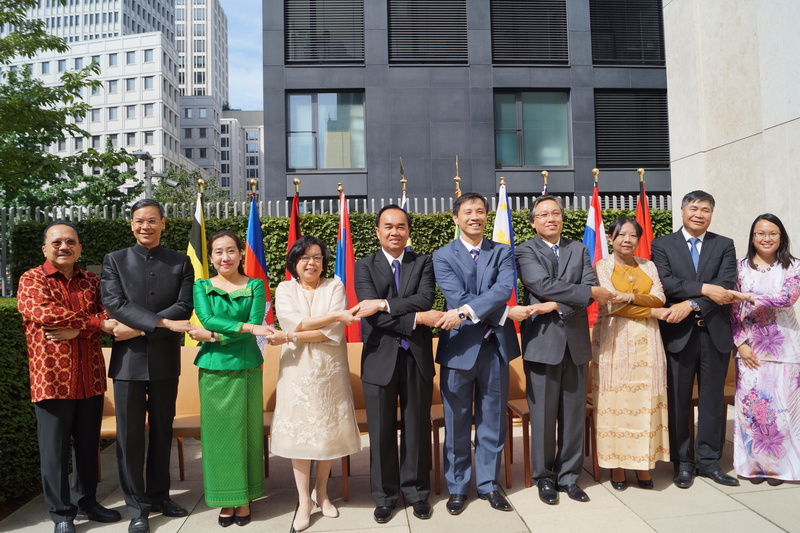 Ambassadors, and officers and staff of all 10 ASEAN Member States in Germany participate in the flag-raising ceremony. 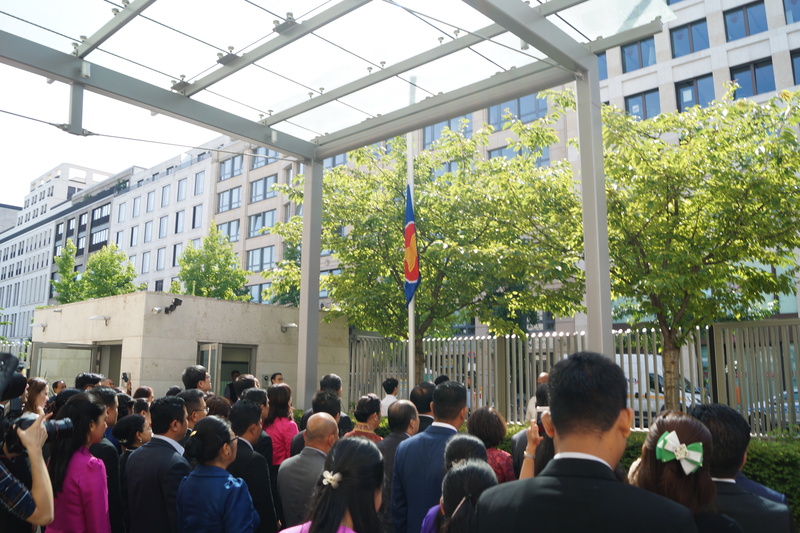 The ASEAN Day celebration started with a flag-raising ceremony attended by ASEAN Ambassadors to Germany, and embassy officers and staff. The singing of the ASEAN anthem, “ASEAN Way,” was led by spouses Jose Maria and Mylah Rubio of the Philippine Embassy. BAC Chair Amb. Laurence Bay, DG Lepel,, and Dr. Gambke cut the ASEAN Anniversary cake. The event also saw the launch of BAC’s “Flavours of ASEAN” recipe book by Philippine Ambassador Melita Sta. Maria-Thomeczek. The book features a collection of some of Southeast Asia’s popular dishes and desserts, including the Philippines’ adobo and turon. Its publication was a project initiated and led by the Philippine Embassy during its Chairmanship of the BAC. A copy of the e-book can be downloaded from the Philippine Embassy website, www.philippine-embassy.de. 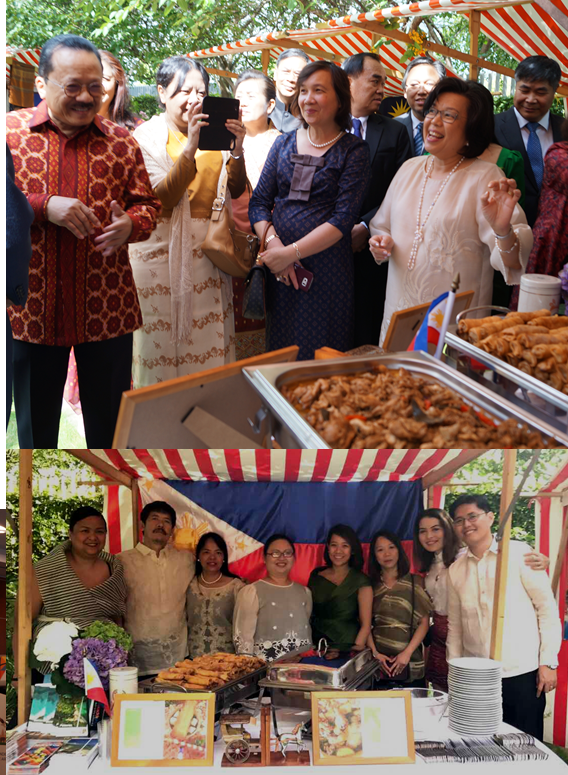 Some of the dishes and desserts in the book were served streetfood-style at ASEAN country stalls at the Singaporean Embassy’s garden. Some 200 guests from various German government agencies, parliamentarians, members of the media, foreign diplomats, and ASEAN embassy staff enjoyed dishes like Brunei Darussalam’s rendang, Cambodia’s khor ko, Indonesia’s satay lilit, Laos’ larb gai, Malaysia’s roti jala, Myanmar’s mohinga, Singapore’s chicken rice, Thailand’s Yam Thua Phu, and Vietnam’s spring rolls. (Top photo) Amb. Thomeczek presents the adobo and turon being served during the reception to her fellow ASEAN ambassadors. (Bottom photo) Deputy Chief of Mission and Consul General Donna Rodriguez with Philippine Embassy staff and family members at the Philippine stall.